Take your hair through a hydrating journey in the Amazon with a mix of native oils and extracts in our super-good, sulphate-free cleansing base. Our aromatic notes of high mountain woods create a sense of calm. Experience a decent cleanse with AB CREW Men's Body Wash. Fortified with French green clay, the formula absorbs deep impurities and leaves your skin feeling fresh, cleansed and invigorated. Infused with the primal scent of fresh-cut, wild verbena. - K.N. Help define your muscles with AB CREW Men's Cutting Body Hydrator, a unique formula that works to hydrate your skin whilst targeting fat below the surface for a more refined, defined physique. Combining mushroom derivative with clinical marine complex, the moisturising blend delivers lasting hydration deep down and focusses on fat below the skin to enhance your muscles and create a more toned looking bod. Infused with a subtle, masculine scent of young vetiver and forest woods. - K.N. Maintain silky, hair-free skin with AB CREW Men's Hair Minimizing Body Hydrator, a unique emulsion that works to reduce and minimise the appearance of hair regrowth for a body that looks smooth and more defined. Combining mushroom derivative with a plant proline complex, the formula delivers lasting hydration deep down and works on the surface to inhibit unwanted stubble growth. Infused with a subtle, masculine scent of young vetiver and forest woods. - K.N. 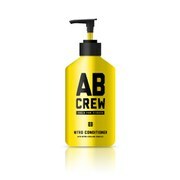 Treat your hair to AB CREW Men's Nitro Conditioner, a super-cooling hair conditioner that works to soften the hair and refresh the scalp with an invigorating freeze. Fortified with Amazonian palm derivative and exotic mushrooms, the formula effectively softens your hair and instantly cools the scalp. Infused with a moreish scent of Spanish rosemary and field mint. - K.N.